Locally owned and serving all of the Kenai Peninsula, CBC Rental & Supply has all the tool and equipment rentals you’ll need for your next project or job. Whether you are a contractor or homeowner, we’re sure to have just what you need. Our professional staff will show you how to safely and successfully operate your equipment before you leave our shop, ensuring a smooth and timely project! 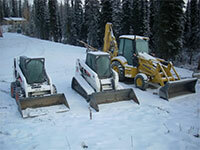 Our equipment, from nailers to backhoes, is kept in top working condition, clean and ready to work when you need it. If you need supplies for your job, look no further than our store! Search our rental catalog on the left, submit a Quote Request, and we’ll help you from there!